Around 70% of the heat lost from a pool is from water evaporation. Therefore by reducing the amount of water that evaporates from the pool, the heat loss from the pool will also be greatly reduced. When added to the pool water, the COVERfree liquid floats to the top and spreads out to form an invisible layer over the water surface. The COVERfree layer then traps the water molecules beneath preventing them from evaporating into the air. Reducing the evaporation rate then reduces heat and water loss. COVERFree uses a patented polymer blend which floats on the water surface when the water is calm. 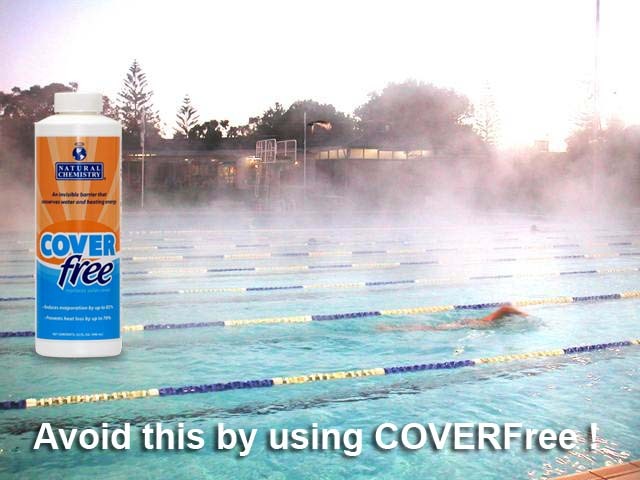 As COVERFree is a unique polymer formula which does not contain any alcohol, it remains in the pool for longer. This allows COVERFree to be added to the pool on a weekly basis rather than on a daily basis. The weekly dosing required by COVERfree reduces the amount of liquid pool cover required by around 65% lowering the cost of using COVERFree as your liquid pool cover.